Saying “I love you” in a romantic sense can be a difficult thing to do. You’re exposing yourself. The response may not be positive. There’s a risk. The good news: there are many ways to express your feelings to the one that you love. Sometimes, injecting a little humor helps. And, on this page, we’ve come to your assistance with some ideas. 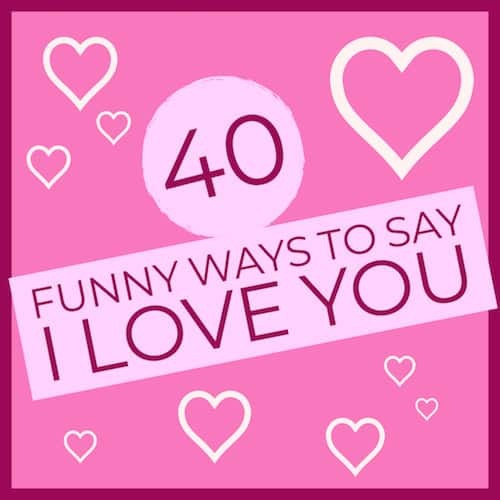 While “there must be 50 ways to leave your lover”; we only came up with 40 funny ways to say, “I love you.” Lucky for you, we made every one count. Hope you enjoy. And, don’t be shy, try a few on for size. 2.) 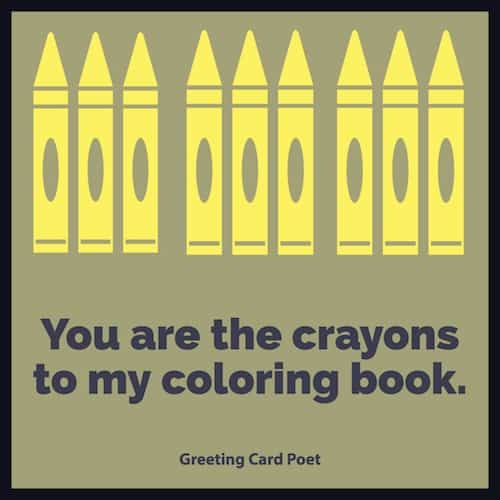 You are the crayons to my coloring book. 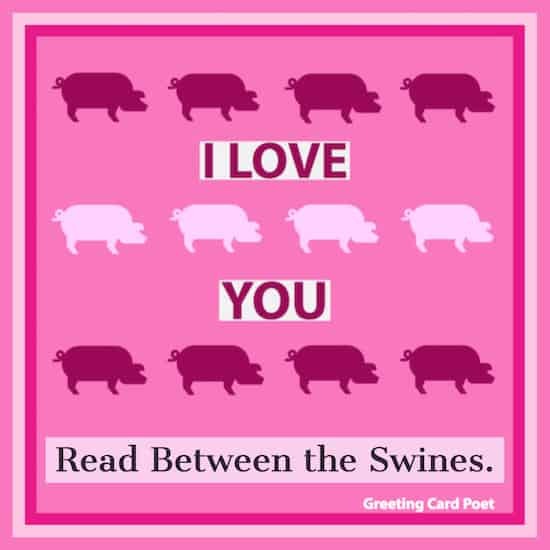 An interesting I Love You phrase that can be read in many ways on many different levels. For us, it symbolizes the completeness that one person can bring to another. You know, the whole “you complete me” thing. 3.) 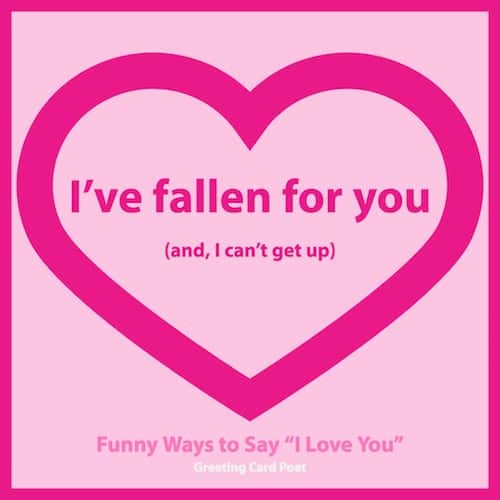 I’ve fallen for you…and I can’t get up. 4.) I just wanna be your teddy bear. 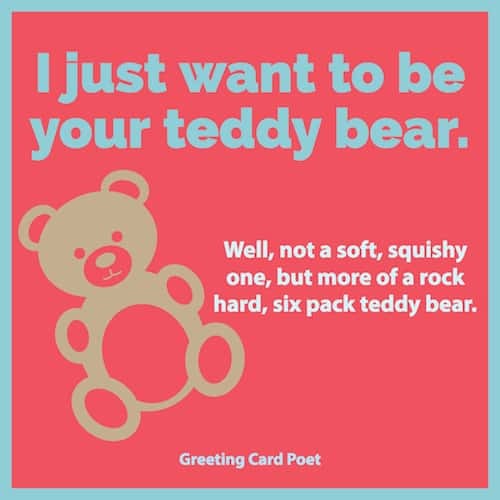 Well, not a soft, squishy teddy bear, but more of a rock hard, six-pack teddy bear. You get it. When Elvis sings, people listen. 5.) When I look at you, I feel a warmth in my heart. 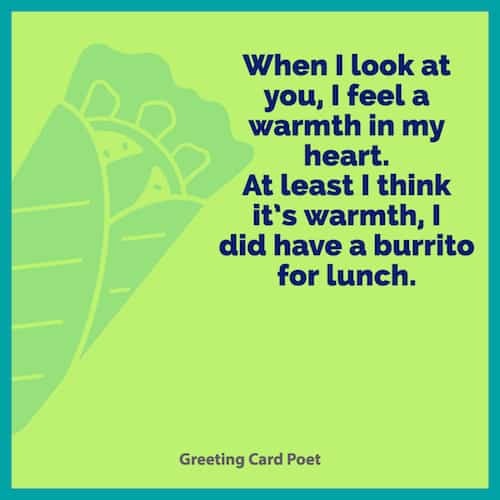 At least I think it’s warmth, I did have a burrito for lunch. They say, “the stomach is the best way to a man’s heart,”and it’s true. Why? Well, because food is the second thing men are most frequently thinking about. 6.) 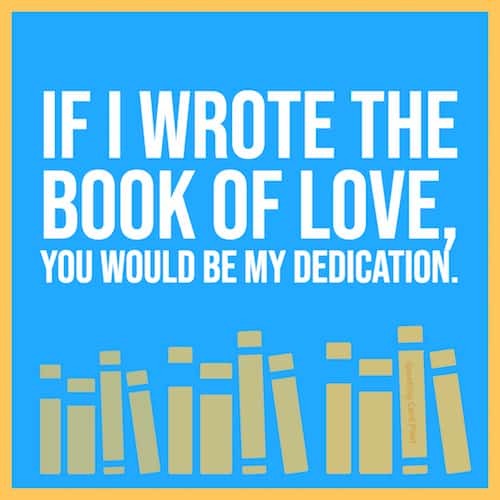 If I wrote the book of love, you would be my dedication. Okay, so it’s not very funny, but it is the type of cute I love you saying that goes a long way to showing you care. Sometimes it pays to play the romance card instead of the humor one. Trust me. 7.) Let’s get it on! No really, stop laughing, let’s get it on! When there’s a fire in the furnace, the feelings intensify. Proceed with caution with this one. Best used in long-term relationships. 8.) Kiss me, I’m crazy about you! Okay, well maybe I’m just crazy. You have to admit it, we all know someone like this. The guy who occasionally goes out in his underwear to get his mail. 9.) Elizabeth Barrett Browning said, “How do I love thee? Let me count the ways.” Okay, let’s see, one, two, three…er, uh three! Well, three is better than two. Your look makes me shiver. Cause I think I can deliver! Hmmm…a little but like a limerick. 11.) I’d like you to guest star on my Love Boat. Some of you are probably too young to remember the TV series “The Love Boat.” It was the stories of passengers that found love on the high seas, or at the very least: high jinx! 12.) My feelings for you are a miracle. Not like walking on water, but pretty darn close. Miracles are a touchy subject, but anybody who can make you feel like a miracle is someone very special. 13.) Has anyone ever told you that you’re hot? No really, I think you might be coming down with something. This could easily be a true story. 14.) Sometimes I think you’re just a dream. But then I wake up and realize you’re my special nightmare. Love is strange and sometimes it can seem like you’re in the Twilight Zone, but somehow reality steps in, and you instinctively discover your true soulmate. 15.) I see stars when I look in your eyes. Or maybe it’s a concussion, hmmm…could be love too. Nothing can stir up the pangs of love like a good blow to the head. 16.) If I could only have one guest for dinner, it would be you. Not as the main dish, as a companion of course. That got awkward really quickly. 17.) I have felt the sting of cupid’s arrow and the pain I feel for you. Sometimes, love hurts. Yeah, yeah. 18.) I got my glasses checked, and now I believe in love at first sight. I didn’t recognize you before. Funny how love can bring a clear picture of the things we really need. 19.) When you frown, my mood is down. And when you smile, I fly a mile. When you laugh, my worries are cut in half. But when you sing, well frankly you’re no Bing. Reality bites. And, there are just so few of us great singers on this planet. 20.) You are like a cup of tea by the fire. Warm, and a little bit hot, sparkling too. For some reason, romance and love always seems to be associated with a nice, bright fire. Perhaps passion is love’s fire log. 21.) I try to think of you all the time. I think of ways I could be thinking of you. I get confused and have to start over. makes me want to do it too. 23.) A kiss is worth a thousand words. Here’s my new book…smooch, smooch, smooch! If only this were true, writing would be so much easier. 24.) I will love you more tomorrow, then I love you today. And I love you more yesterday, than I did today. 25.) They say you are the sun, the moon, and the stars. For me, you are the dishes, the laundry, and the stove. No really, I mean it. So heartfelt, I have a tear in my eye. And soon, I’ll be sleeping on the couch. 26.) Love is in the air. I had beans for dinner. It is a fact of life that everyone passes gas at some point. Often, even a well-timed cough can’t cover it up. 27. In my heart is a beautiful feeling for you. Either that, or I have atrial fibrillation. “A fib” is a big catch phrase on TV commercials for blood thinners these days. And play my brain like a violin. Music and romance go hand in hand. 29.) I may have had one too many cocktails. But in my eyes, you’re a vision! A vision of what I’m not quite sure. But a vision none the less. A little hair of the dog can often cloud true love and sometime make it seem more passionate then it really is. 30.) Be mine with all your heart and soul. Some nice roses wouldn’t hurt either. Emotions are all well and good, but some tangible gifts are refreshing. And poop on a car. Okay, maybe I crossed a line here, but you have to admit it is kind of funny. 32.) Dove, glove, above, shove, whereof…hmmm. A poet struggling for a rhyme for love. But, you’re worth the struggle. I love you. Sometimes, writing is just hard. 33.) If I were a flower, I would bloom in your sunshine. If I were a weed, I would wither in your shadow. Deep, not really funny, just deep. I was looking for my keys. For some reason, the phrase “looking for love in all the wrong places” comes to mind. 35.) Love is like a box of chocolates. But there’s always a surprise. Aw, isn’t that cute? Apologies to Mrs. Gump. 37.) There must be a reason I fell in love with you. For the life of me, I just can’t think of it right now. I don’t know, I was just feeling kind of Zen in the moment. 39.) I love you because you’re perfect. And believe me, I should know. Oh yeah, it takes one to know one. 40.) When all else fails, to win a heart, do the dishes! From the “actions-speak-louder-than-words-camp,” fall back on a proven winner. There you have it. Try a different saying every day of the week for fun. 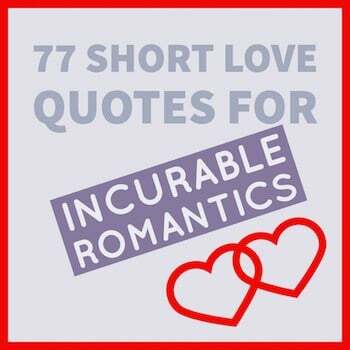 And, save your best for Valentine’s Day, birthdays, and anniversaries. Tim Moodie is a Copywriter and Creative Director. He spent many years writing funny greeting cards, coffee mugs, and toilet paper for Recycled Paper Products. In addition, he created the box copy for novelty gifts including the Jesse Ventura Action Figures.